Knowing about plant diseases and pests is not necessarily essential to plant community studies, but it will give you more understanding of patterns to look for and other ecological interactions within communities. In the world of plants, anything that has an adverse effect on the health of a plant is considered a disease. There are two basic types of diseases in plants, biotic and abiotic. Biotic diseases are caused by other organisms, while abiotic diseases result from something in the plant’s environment. An organism that causes a biotic disease is known as a pathogen, which may be a virus, bacterium, nematode, plasmodium, parasitic plant, insect, etc. Abiotic factors include soil compaction, drought, flood, soil fertility problems, an unusually early frost, herbicide damage, injury from a light left on too long at night (results in too much photosynthesis and not enough respiration), mechanical damage (e.g. wind or machinery damage), ground level ozone, improper planting, or any number of other things. Generally, if the signs and symptoms of plant disease appear in a random pattern, either within the plant or within the site, the cause is likely to be biotic. If the pattern is regular or uniform within the plant or the landscape, especially if the symptoms appear on a wide range of species, the cause is likely to be abiotic. As with any rule, there are exceptions, but this is a good place to start. Figure 7.29: An illustration of the disease triangle. For a disease to spread, a pathogen, host, and favorable environment are all necessary. 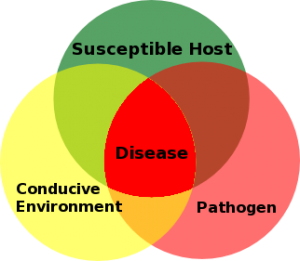 In order for a disease to progress, there have to be three components present: a pathogen, a host, and a favorable environment for disease development. These three things make up what is known as the Disease Triangle. If any one of these is removed from the system, the disease will not appear. All three factors should be studied to make either a diagnosis or management decision.